Memento Mori Halloween Edition: Thursday, October 26th! Resident DJs Malefic, Ana Vice, Bela (Alejandro), and Stalagmike with special guest DJ Joe Hart (Procession, Svmmon) spinning a variety of outstanding classics, obscurities and new developments! Rusted Autumn will be vending macabre and unique creations! FREE from 10PM until 4AM. 21+ and please bring valid ID. 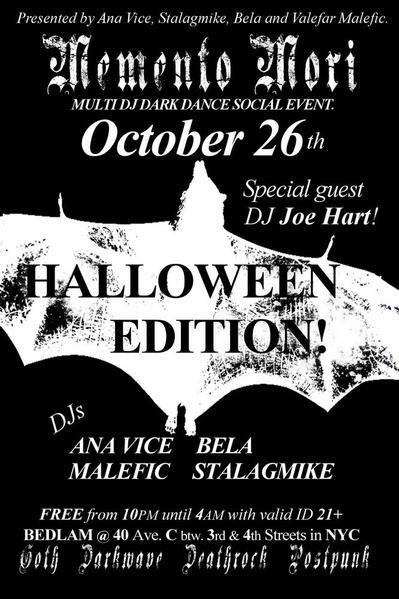 Dress code: Goth, Vampire, Witch, Ghoul, Sinister Dandy, Dark Glam, Edwardian, Victorian, Deathrock, or basic black. NO blue jeans, caps, sneakers, or flip flops allowed. There is dark and lovely decor, comfortable seating, clean restrooms, and an established dance floor. A mixture of nostalgia, revival, tribute, & the here and now! Presented by Stalagmike, Bela, Valefar Malefic, and Ana Vice. Invite by Ana Vice 2017.